A colour-exaggerated image of Saturn with the sun behind it, taken by Cassini. If you ask John Zarnecki what his favourite Cassini image is, you might be a little surprised at the answer. The Cassini-Huygens mission, which ended in a momentary, spectacular burst of flame on Friday, has been responsible for some of the most breathtaking images in the history of space exploration. It is the Cassini space probe that sent back the extraordinary shot at the top of this piece, of Saturn eclipsing the sun, its rings lit from behind. It's one of thousands of beautiful photographs, some of them grand and sweeping, some almost intimate, that the old spacecraft has taken. But Zarnecki's favourite is none of those. It's this simple line graph. Zarnecki is a professor of astrophysics at the Open University and the principal investigator on Huygens, a little lander that the Cassini probe carried with it for years through silent space. In 2004, Huygens detached from Cassini and floated on parachutes down through the atmosphere of Titan, Saturn's (and the solar system's) largest moon and until then one of its most mysterious. Then the lander bumped on to the ground. When BuzzFeed News interviewed Zarnecki at the Royal Astronomical Society, where he is president, he showed us a small, finger-sized metal object, spring-loaded. "This is a penetrometer," he said. "I describe it as an instrumented finger." The spring-loaded mechanism detects the force of impact. One just like it was sticking out of the bottom of the Huygens probe. "For 16 milliseconds, it was the only thing interacting with the surface of Titan," he said. In 1980, the probe Voyager 1 flew past Titan, taking close-up images for the first time. It revealed that it was cloaked in a thick haze, too thick to see through to the moon's surface. Part of the Cassini-Huygens mission's objective was to get close to it again: to see through the haze with radar, to sniff the atmosphere with special instruments, and, of course, to drop Huygens on to it to get some images from the ground. "We weren't sure if the haze would go right to the surface, so it wouldn't see anything," said Zarnecki. "Or if the 300kg of Huygens probe bashing into the surface would destroy it on impact." So the team tried to think of what science they could do with just that moment of impact. "And this [the penetrometer] is what we came up with. [Even if it was destroyed], we'd be able to differentiate between ice, rock, gunge, or whatever." Those 16 milliseconds worth of data – as seen in the line graph above – were enough to tell Zarnecki and the Huygens team that the surface of Titan was soft yet solid, "analogous to wet clay [or] lightly packed snow". Zarnecki said it was a mix of gravel and dirty water ice. Even if Huygens had been destroyed, that would have been a fascinating discovery. But Huygens was not destroyed. It was able to send back, via Cassini, startling images of the surface of Titan, bathed in an orange glow: sunlight filtered through its hazy atmosphere. The first image of the surface of Titan, taken by Huygens on 14 January 2005. And in orbit above it, Cassini's radar was able to paint a picture of Titan that no one expected. Not only was it the only moon with an atmosphere, it was also revealed to be the only body in the solar system, other than our own planet, with standing bodies of liquid – seas and lakes – on its surface. These seas are made of ethane and methane, and Titan is such a big moon, bigger than the planet Mercury, that its seas are huge too. The largest is the size of Earth's Caspian Sea. The radar also found that, beneath the water-ice surface of the planet, there was a huge subsurface ocean of liquid water. Andrew Coates, a professor of space physics at University College London, told BuzzFeed News that Cassini's role in the exploration of Titan was his mission highlight. He had a more conventional favourite image than Zarnecki's: "The Day the Earth Smiled", below, another image of Saturn backlit, but with Earth visible as a tiny spot in the background. Coates leads Cassini's electron spectrometer team, which analysed Titan's atmosphere, to see what chemicals it was made of. "The most interesting result from our instrument," he said, "was discovering very heavy organic and nitrile molecules at the top of Titan's atmosphere." These big molecules – long chains of carbon with other atoms attached – formed the haze that had hidden the surface from Voyager. "It was completely unexpected," said Coates. These molecules were forming as solar rays hit the upper atmosphere, and were falling as a sort of rain to form dunes on the surface. "The Day the Earth Smiled". The Earth is visible below Saturn and to the right. Together, these findings – the standing liquid, and the big organic molecules – changed scientists' views of Titan completely. Thanks to Cassini, it is now seen, along with Mars, as one of the most promising places to look for alien life. "It looks like there's subsurface water; certainly there are organic molecules," said Zarnecki. "Put the two together, and it looks like a candidate for simple life." Cassini's revelations weren't limited to Titan. A fly-by on Saturn's much smaller moon Enceladus offered startling discoveries as well. A radar map of Titan, taken by Cassini. The blue-black areas show seas or lakes of liquid hydrocarbons – mostly methane and ethane. "It spews out these geysers," said Coates. "From a subsurface ocean." This distant, icy world – 1.5 billion km (a billion miles) from the sun – had liquid water. That was a surprise – the moon is only about 500km (310 miles) across. "An object that small should be pretty inert," said Zarnecki. He said it's probably tidal stresses – the little moon being pulled around by the gravity of its giant neighbour, Saturn – that generate the heat to keep the water liquid. As with Titan, Cassini's exploration of Enceladus pushed it right to the top of the list of places to look for alien life. "There could be bugs crawling around," said Zarnecki. "Absolutely." Water vapour escapes into space from geysers on the surface of Enceladus. Cassini has now hurtled into the atmosphere of Saturn and was destroyed. The process was swift; it travelled at about 30km per second (67,000 mph) relative to Saturn, and the time from when it first reached the top of the atmosphere to when it lost contact with Earth was measured in seconds. It is the culmination of a decades-long story. The probe reached Saturn in 2004; it was launched in October 1997. The mission had first been proposed in 1982. When BuzzFeed News spoke to him, Zarnecki held up a beaten-looking memory stick, the sort you could buy for £5 from Argos. "This crappy memory stick, that's the total hard disk space on Cassini," he said: about two gigabytes. "The cameras have about 10% of the pixels that my phone does. "It's 30-year-old technology; it was designed in 1993 and you use already well-tried and tested technologies, so it's technology of the 1980s. It's done an absolutely fabulous amount." 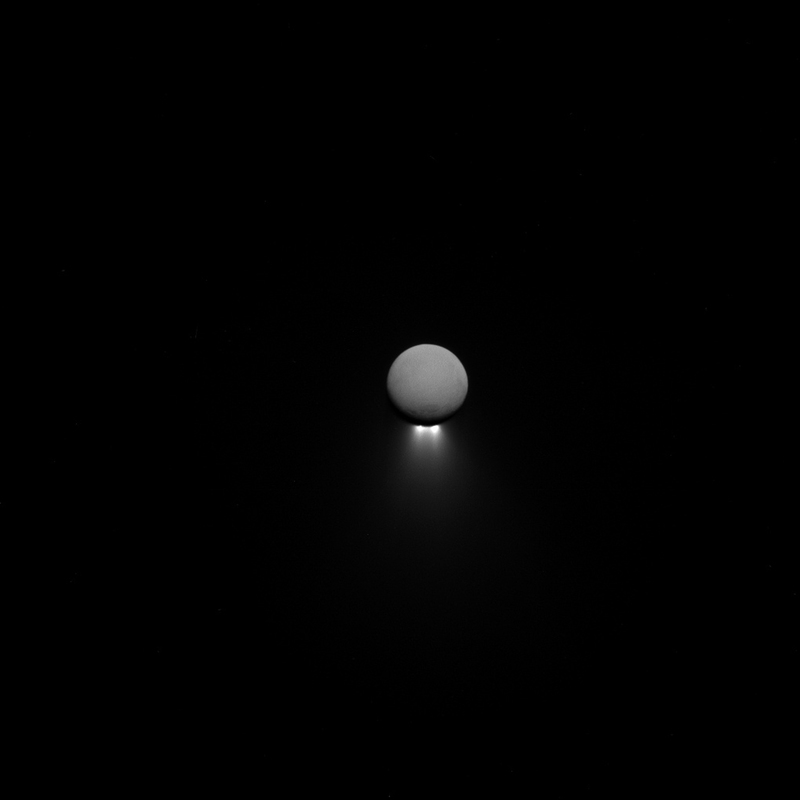 "Bull's-eye Moons", an image of Enceladus in front of Tethys, two Saturnian moons, above the rings of Saturn. Zarnecki said the probe had become almost a person to him. "We spent seven years designing and building the instrument suite," he said. "It becomes part of you; it becomes, you know, your baby. I don't really have the words for it. You give it a personality, you've lived with it for so long." For Coates, speaking a few days before the probe tumbled into Saturn's atmosphere, "it will be very bitter, and very sweet. But the main emotion will be the sweet part. "It's been such a fantastic mission. The primary mission was only four years; it's been extended and extended, and extended again. It's sweet that it's lasted this long, it's passed all this data back to us. But there will definitely be a bitterness, a sadness, when it takes the plunge." Zarnecki was less ambivalent. "No, I'm not sad," he said. "It's way beyond its planned lifetime. I regard it as a celebration." He hoped to go to a final party at NASA's Jet Propulsion Labs when it happened. "Sadness, yeah. But for me the positives outweigh it. It's a glass almost completely full." Both scientists remember the terror of the moment of birth, when the delicate instruments they had spent years designing were balanced on several tons of rocket fuel and fired into space at several times the speed of sound. "I was at the launch," said Coates. "You work so hard on the instruments, making sure it's going to work, then you put it on top of a rocket with the huge noise and the flames. You think, My little instrument is on that." It launched in the dark; they watched from several miles away. "You see the flames coming out of it," Coates said, "then eventually the noise reaches you, and the rocket goes behind the cloud, lights up the cloud from the far side – you wonder if it's blown up, but it continues on its way." Zarnecki is more concise: "It's terrifying." False-colour image, taken by Cassini, of a giant hurricane on the surface of Saturn. There is an irony in the Cassini-Huygens mission, which is that its own success has made any future follow-ups much harder. Since its revelations about Titan and Enceladus, the Committee on Space Research (COSPAR, part of the the International Council for Science) has marked both Titan and Enceladus as among the most likely worlds to contain or support life. What that means for space research, in practical terms, is that future missions to either of those worlds have to be far more careful about accidentally contaminating them with terrestrial life – bacteria or other microbes that might have clung to the spacecraft. (The ability of some microscopic life to survive almost any extremes of heat and cold is amazing.) It is much more expensive to sterilise a space probe to the level that the COSPAR regulations require for these life-friendly worlds. That may be part of the reason that Zarnecki's ambitious follow-up proposal was never picked up by NASA. He and his team wanted to go back to Titan. "With a boat!" he said. "I wanted to land it in the sea, and with an orbiter and an aerial platform – a balloon. Titan is a great place for a balloon, because it's got a thick atmosphere and low gravity. It could hang up there for years." The proposed Titan Saturn System mission. His proposal got down to the last three out of 38 possibilities considered by NASA – "they chickened out at the last minute and chose some boring Mars mission," he said, before checking himself a bit and saying "it's not really boring". The idea isn't dead, he said. "I hope that in my lifetime something like that will happen. But we shall see. The trouble is there are so many brilliant space science missions to do." It won't be soon. By way of illustration, he points to ESA's Jupiter Icy Moons Explorer. JUICE, which was commissioned in 2015, is still five years away from launch, and won't arrive at Jupiter until 2030. "You have to be patient to be a planetary scientist," said Zarnecki. But his mission may happen yet. The reason that Cassini crashed into Saturn is also because of its own success. It revealed the possibility of life on Titan and Enceladus, and its handlers were not willing to take the chance of it crashing into one of them, with its possible payload of Earth microbes, so they ended it utterly, in an annihilating blaze of heat and light. But Huygens landed on Titan at a gentle few metres per second. It, like Cassini, was built before the discovery that Titan could harbour life. "When we launched, Titan was not thought to be a likely candidate, because it's so cold," said Zarnecki. "We didn't know about the subsurface water. We did everything that was required, but that didn't include sterilisation." That means it is perfectly possible that there are Earth microbes, right now, on the surface of that cold, distant world. At the temperature on Titan – about -180°C, only about 90°C above absolute zero – they almost certainly can't grow or reproduce; but they may be able to sit there, in suspended animation, essentially indefinitely. And in a few billion years, things will change. The sun will start to reach the end of its life; it will expand, enormously, consuming Mercury and Venus and probably Earth, and certainly scouring Earth of all life. "But the outer solar system temperatures will go up," said Zarnecki. "All that ice will melt, we'll get oxygen in the atmosphere. Titan might become a new Eden. A balmy paradise." And it's possible, then, that a microbe that has sat motionless in the cold for billions of years on a space probe will feel the warmth of the sun again. "It might burst into life!" said Zarnecki. "We might be seeding life on Titan. What a legacy."